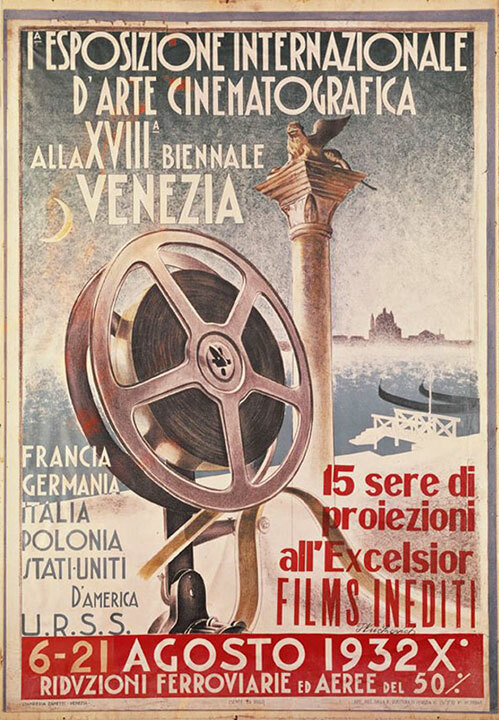 The very first film festival poster, for the very first film festival—the 1932 International Exhibition of Cinematographic Art at the 18th Venice Biennale, or what would become the Venice Film Festival—set the tone for the next 80 years of film festival graphic design. A film reel, mounted on a projector, stands triumphantly just below the winged lion of the Piazetta di San Marco; two signifiers in one space: the idea of cinema and the locale of the festival. For the next 80 years, until the demise of celluloid, and no doubt even beyond, the film reel or the film strip, usually coupled with some local landmark, has been the ubiquitous symbol of film festivals the world over. It may be yet another failing of the digital revolution that a DCP case will never have the symbolic potential or the graphic possibilities of a reel of film. 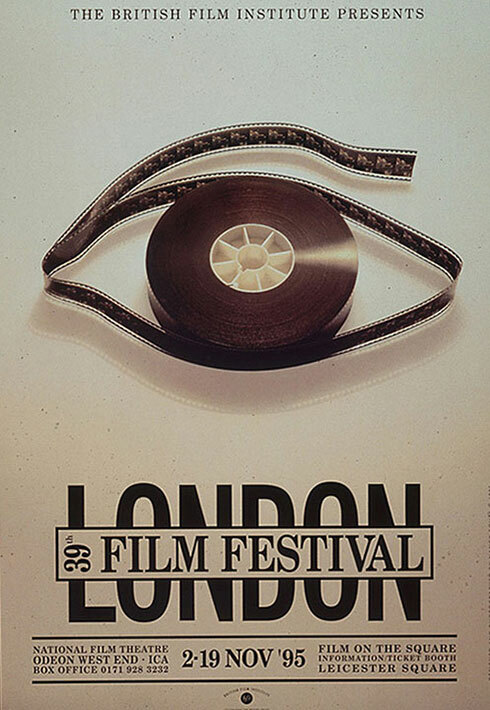 That said, is anything more tired or clichéd than a film reel or a film strip on a film festival poster? 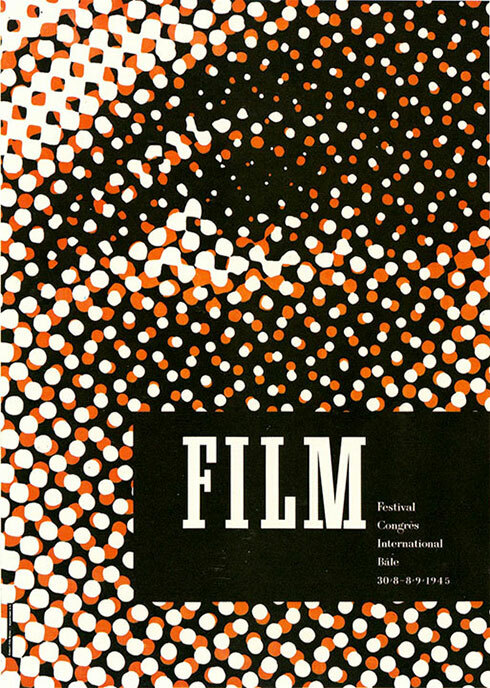 As early as 1945, Swiss designer Fritz Bühler already recognized this with one of the first great film festival posters, his pixellated duotone close-up of an eye for the Film Festival Congrès International of Basel. But of course, one of the challenges for any graphic designer is to subvert cliché and reclaim it, and the film reel, or the film strip, has given ample opportunity over the years for wit and invention. For the 2nd New York Film Festival in 1964, the great Saul Bass conflated the iconography of the film strip with the idea of virtual foreign travel in a typically simple and inspired image (in a poster that Mad Men fans have probably spotted hanging on Peggy Olson’s office wall). The film strip as a design element gives ample opportunity for invention as these two superbly minimal transformations attest. The Cameraimage Festival of Cinematography of Bydgoszcz, Poland, awards gold, silver and bronze frogs to the best cinematography of the year, while a celluloid origami crane is a perfect image for Pittsburgh’s Asian American Film Festival, the equally inventively named Silk Screen. 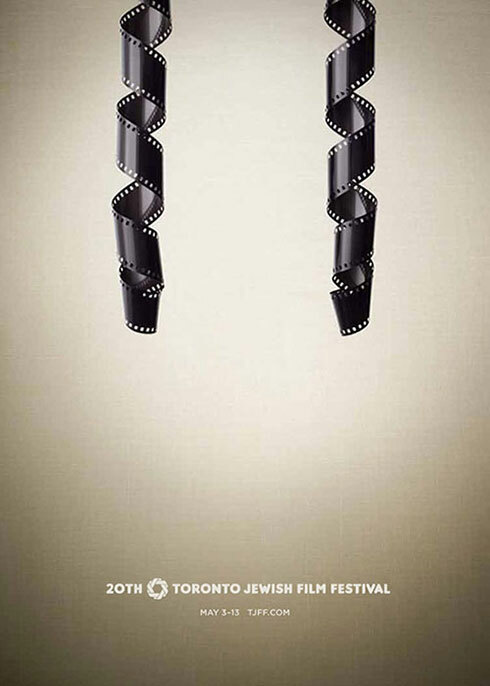 But perhaps my favorite twist on celluloid iconography, is this one for last year’s Toronto Jewish Film Festival in which film strips become Orthodox sidelocks. I also love the annual series of four posters—thematically related yet decidedly lacking in typical film festival iconography—that Gerwin Schmidt designed for the Munich Documentary Film Festival each year from 2001 to 2009. As festivals have proliferated all over the world it feels as if designers have had to become ever more inventive and abstract. I particularly like these two posters for festivals in Nijmegen, Netherlands, and Thessaloniki, Greece which rely on mystery, absurdity and a strong graphic wallop to capture the attention and convey the allure of cinema, without any specific reference to cinema. 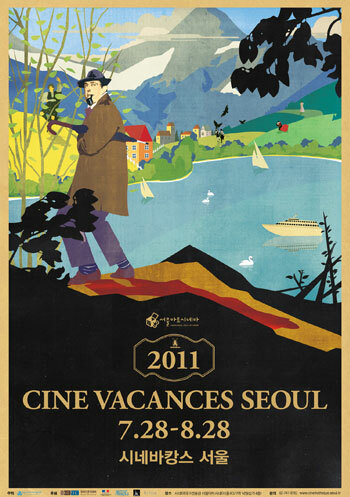 But one of my very favourite recent festival posters is this design for a festival in Seoul that does use a specific reference, placing Monsieur Hulot in what looks like a mid-century travel poster. The use of actual actors or personalities is rare in film festival posters, which try to be as all-inclusive and unspecific as possible, but it should be no surprise that the one festival that has used movie stars in their posters over the years, is Cannes. The Cannes poster has had a checkered history—some of them are dreadful (I’ll name no names) and there has been no real sense of a single identity over the years. But for the past three years they have established a more consistent look with an exquisite marriage of monochrome movie star glamor (though decidedly Hollywood-centric) and brilliant typography. 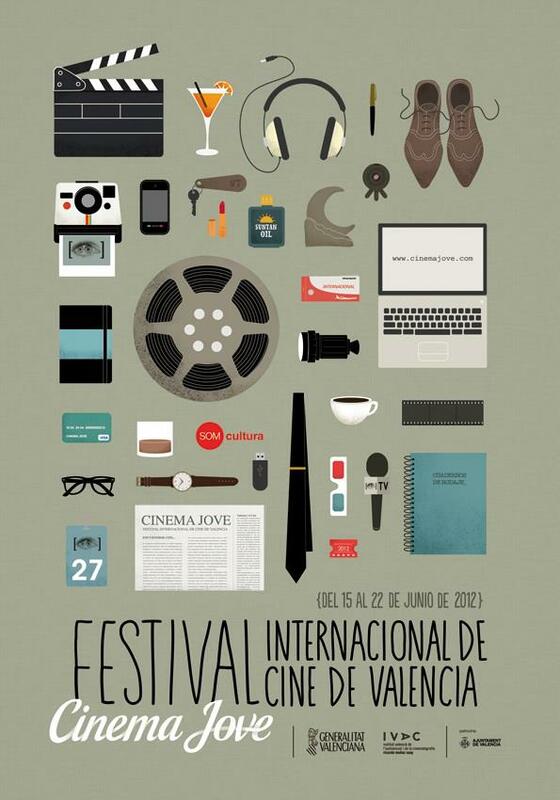 The poster for last year’s Valencia Film Festival also marries the old and new. It plays on the very current and ubiquitous Things-Organized-Neatly style, laying out the accoutrements of a film festival visit (though who brings a clapperboard to a film festival?). The details are both contemporary and retro (just as the illustrative style is mid-century Mad Men meets Instagram Kit Photo): there’s a laptop and a flash drive and an iPhone, but there, in the center of the poster, is not a DCP case but a film reel, as much the international signifier of cinema as it was 80 years before. Whether Valencia still screens films on celluloid is decidedly beside the point.